As an illustrator, the ramifications of the Old Testament’s Second Commandment invariably gives me pause for thought; particularly in this week leading up to the Passover holiday. 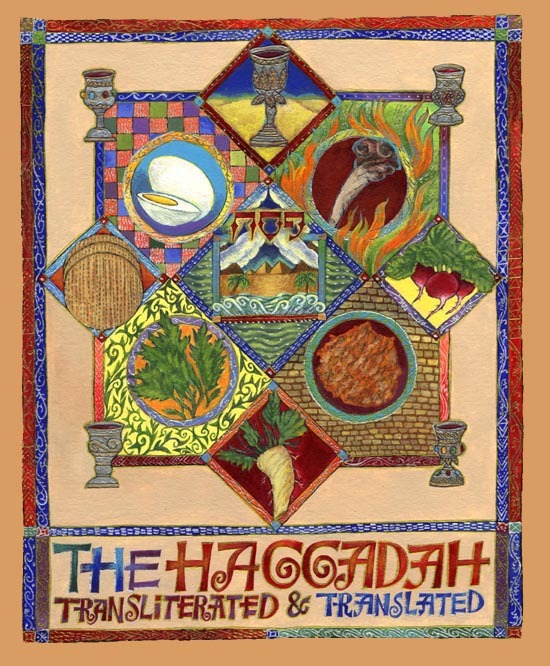 While I enjoy revisiting traditional illustrated Haggadot like the pedestrian Maxwell House edition and its lux cousin, the Syzk Haggadah with it’s lush, detailed imagery, I am also interested in seeing the versions present at various family sedarim that include feminist and gender-free haggadot, the Moss Haggadah, Leonard Baskin’s illustrated Haggadah as well as various reproductions of antique Haggadot. In this visual interpretation of the second commandment, two angels appear in the upper and lower waters of creation separated only by a narrow, fiery horizon. 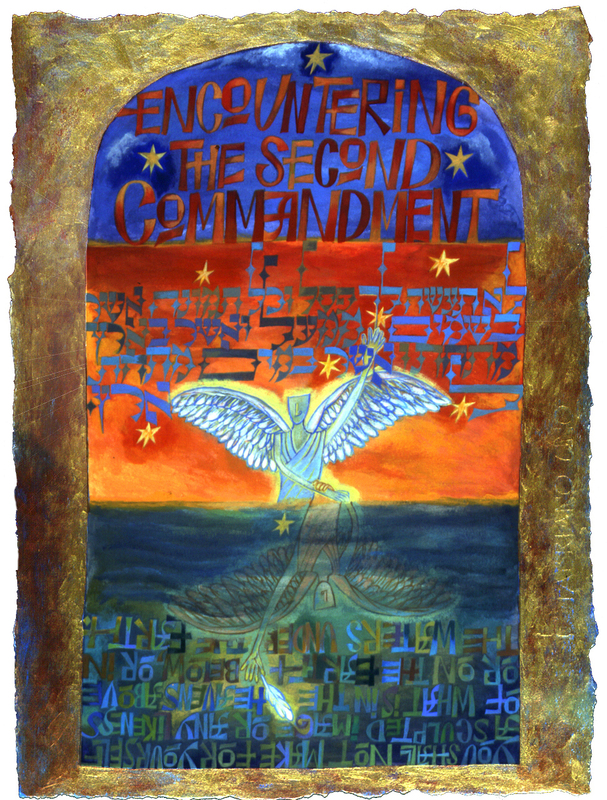 the angel of the upper waters reaches towards the commandment written in Hebrew, representing its heavenly origin. The angel within the lower waters of earth containing the English translation of the commandment is a distinct reflection of the one above, in the sense that we were created in god’s image. While reaching for its’ feather, fallen in the transition or translation to the mundane world below, it grasps the upper angel’s hand, attempting to retain the tenets of holiness. I created this image as a metaphor to explain the struggle of artists through the ages who have attempted to balance their need for self-expression with their needs for community and religious observance. (The title of this work would also become part of the title of my book, Between Heaven & Earth: An Illuminated Torah Commentary (Pomegranate, 2009). 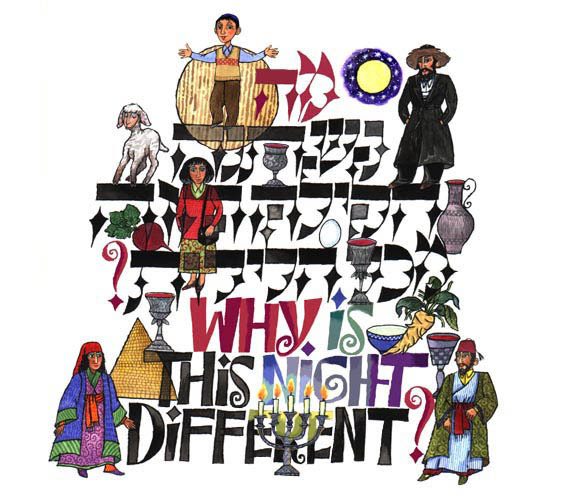 Cover illustration & calligraphy for The Haggadah: Translated & Transliterated (Judaica Press, 2002) The interior illustrations were B/W halftone details pulled from the cover illustration. Of Plagues & Promises: Detail from illustration for Parashat Bo from Between Heaven & Earth: An Illuminated Torah Commentary (Pomegranate, 2009). 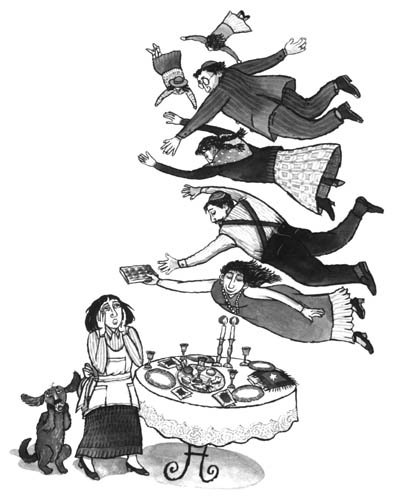 Although Parashat Acharey Mot will be read this year on the Sabbath before Passover, the imagery for Parashat Bo will be more readily associated with the story of the exodus in the Haggadah. Of all the plagues brought on Egypt by God, the 10th and last, Death of the Firstborn, is the most horrific. 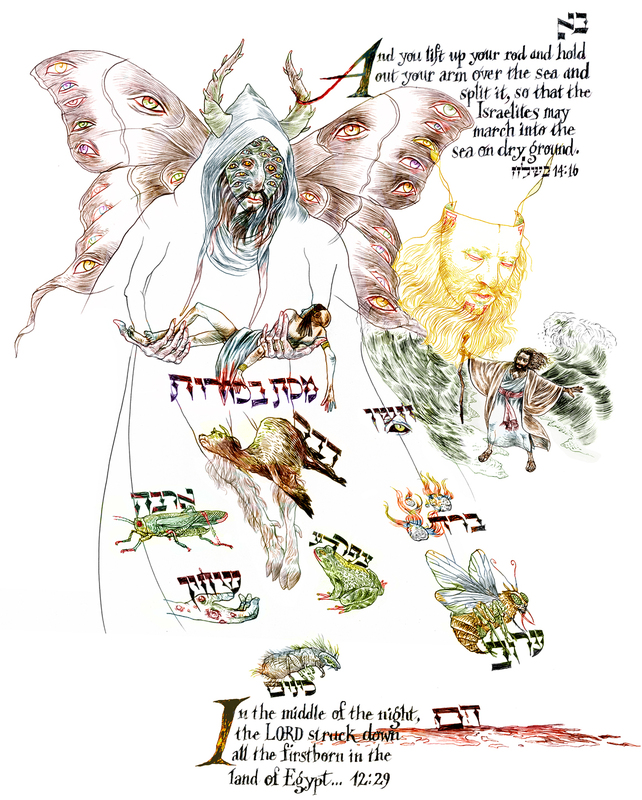 In this illustration I have presented the Angel of Death, which the Talmud places in the category of destructive angels called Malach Ha-Movet. Why the Angel of Death, when in Exodus, God makes it clear that He, and not an Angel will implement the 10th plague? Are we to understand that all angels are aspects of our Creator? And were all the events in Exodus designed to help us understand the evil inclination as an inextricable element of our natures? 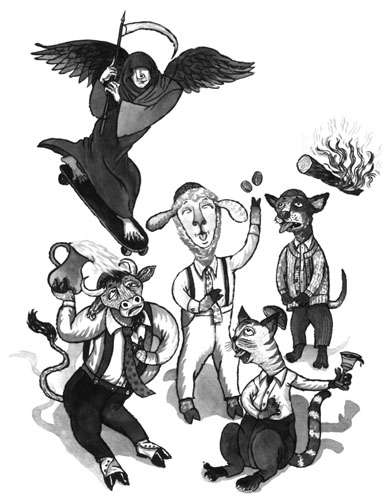 In the Babylonian Talmud it states that, “If God created the evil inclination, He also created the Torah as its antidote.” Perhaps that is all the answer we need…? This entry was posted on April 12, 2011 at 9:56 AM and is filed under Uncategorized. You can follow any responses to this entry through the RSS 2.0 feed. You can leave a response, or trackback from your own site. Thanks, Bernadette! Was there any specific image that caught your eye? Thank you for visiting, Jewish Star Jewelry! I post at Imaginarius as often as time and sanity permit; your comments and questions are welcome, so stay tuned!